Lillian Hunter’s life is destroyed when she’s implicated in setting the fire which killed her husband and daughter. Seeking peace and restoration, she pulls the pieces of her shattered life together and accepts a position at a college in another state. Surrounded by a loving family that has adopted her as their own, Lillian struggles with new life, new love…and new danger. Fires are being set in which she is once again implicated. Doubting her own sanity, Lillian takes steps to ensure she isn’t setting the fires. But if it isn’t her, who is it? And why, after she’s moved halfway across the country, have they followed her? A day of reckoning is coming as Lillian seeks to exonerate herself and claim retribution for the destruction of her life. 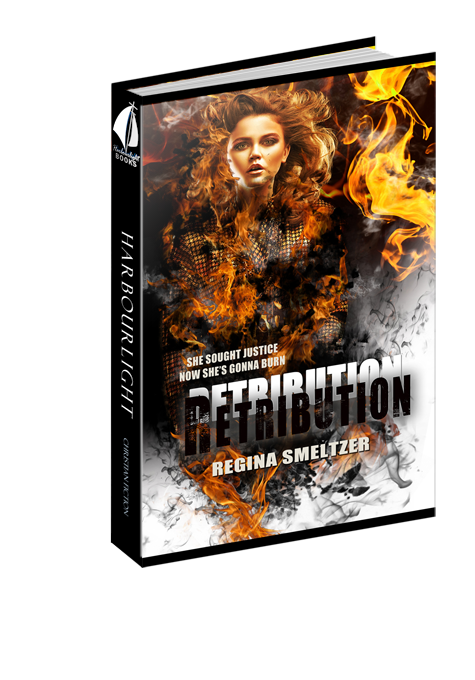 Will she discover the truth before her new life is consumed by the flames? “You got any matches on you?” The boy, not more than sixteen, snickered over his words. He had a crowd of followers: boys dressed in jeans with waists cinched around their thighs and girls wearing shirts that looked as if they had shrunk in the dryer. The teens rallied around the outspoken leader like groupies to a rock-star. Lillian did her best to ignore the barb even though the pain of his words took her breath away. She had been taking a chance going to town alone, but she only needed to make a couple of stops. Her mother’s worried face flashed in front of her. Only one hour out of the house on her own. She used to be a trial attorney, free to do her own thing. But that freedom had disappeared two years ago, along with the rest of her life. The woman clutched her leather purse to her chest as her face paled beneath layers of well-applied makeup. “Lillian, it’s been a long time.” The sleeve of the man’s black cashmere coat bunched beneath her grip. “Sorry we can’t stop and chat, but we’re already late…” Cynthia glanced around, apparently trying to decide where she was supposed to be. The couple walked on; their pace doubled. As she reached the corner, Cynthia turned her apprehensive face toward Lillian. Wishing she had not tried to resurrect a friendship, to break the ice on a pond that should never have frozen, she stiffened her back and entered the pharmacy. Vitamins for her eyes. That’s what the optometrist had recommended. Not rude exactly, but far from jovial. Hadn’t she represented this woman’s family member once? A cousin or something? The vitamins were quickly rung up, bagged, and thrust toward her. No “good bye.” No “what else can I do for you?” Just steel-cold eyes that chilled her blood. Anger built as she headed back to her car. After the fire, no one had listened to her side of the story, preferring instead to fabricate their own. Clenching her jaw until it ached she pointed the car toward her parents’ home—her home for the past two years. The ad for a job in South Carolina had come as a surprise. Even more surprising was her acceptance if she wanted it. She tromped on the gas, decision made. She would escape Cleveland and create a new life for herself. Heavy velvet curtains covered the den windows and hid Cleveland’s October chill. The air, scrubbed clean twice every hour, thanks to the ventilation system that guaranteed removal of ninety-nine percent of the disease-causing viruses, smelled like fake pine. Thick beige carpet muffled Lillian’s footsteps as she entered the room. The silence pounded against her ears even as the tension in the room blistered her face. She swallowed against the thickness in her throat. What could she say that would sway her parents from the verdict they had already chosen? Ralph Goodson neatly folded the newspaper, pursing his lips to form a hard line across his face. A line-backer in college, Ralph Goodson had maintained his athletic physique through long hours of personal training. Graying only around the temples, he still turned the ladies’ eyes. Even though they had been over this before, she knew he would bring it up again, perhaps hoping she would change the story about how a faculty position became available in the middle of a semester, and why she needed to leave home. Attorney Goodson stared at Lillian with his intimidating trial-glare for several seconds before rising from the leather recliner. Perhaps out of habit, perhaps buying time to compose his deposition, he hesitated long enough to pick a speck of invisible lint from his jacket before walking to the fire place. As she waited, her heart pounded against her ribs more violently than at any trial she had led. Hours spent researching her adversary had allowed her to arrive in court, prepared to battle wits with the opponent, and she had been successful. But this man used to bounce her on his knee, share pretend tea parties, and even play dress-up on occasion. Together they had buried Goldie the goldfish. As his reputation as a top-rate trial attorney grew, Ralph Goodson’s time at home had diminished. Now she hardly knew the man who leaned against the white brick with one arm draped across the polished walnut mantle. “No, don’t start, Mom. You know I’m right. I can’t leave the house without your approval. When I’m on the phone you hover just around the corner. You tell me when to go to bed and when to take a shower, as though I no longer have a mind of my own.” She sounded more like an adolescent than a grown woman, and she hated the reversion. Lillian’s back stiffened as she tried to control the emotion that welled up. In the past two years, her feelings had coiled together in her gut like a nest of snakes, impossible to separate anger from fear or hate. “I’ve asked advice from the wisest of all. I’ve been talking to God about this move ever since the announcement came in the mail.” She sighed, knowing her parents held little regard for the power of prayer. “I can’t live the rest of my life inside this house.” Lillian looked at her mother. Designer clothes and sculpted hair battled against Lillian’s soft curls and sweat shirt. Two years ago, her parents’ home had felt like a womb, protecting and safe. Now the walls loomed over her like a prison, both of her parents acting as wardens. The furnace turned on and its low rumble broke the hard silence. The curtains puffed away from the window as air blew from the vent. The artificial scent caused her stomach to churn. Lillian’s mouth tightened. “According to most of Cleveland, I set that fire.” It always came back to the fire. Unfortunately, many did. Lillian had no alibi for the time in question. She squeezed her eyes against the scenes that rolled across her memory. Her heart thundered against her ribs, trying valiantly to seek escape from its confinement. She pushed both fists into her chest, wishing she could force her fingers through tissue and muscle and create an escape for her dead heart. “You could have had any man you wanted.” Her mom reshaped the nap of the carpet with her foot. “I got the man I wanted, and now he’s gone. And my job is gone. My friends avoid me; my family…” Tears flowed down her cheeks. Hands fisted at her sides. She looked from one distressed face to the other. “I don’t need professional counseling; I need a life.” She stumbled from the room. As he walked, his breath came in tight gasps, not from exertion but fear. Why did he continue to allow the memory to control his steps? No one forced this torture on him; no one even knew of his weekly tour into the nether regions of evil. But until retribution had been served, the compulsion to relive what amounted to the end of his life continued, as though it were a movie that automatically rewound at will. He walked through the familiar neighborhood, crossing one quiet street, then the next, not stopping to look both ways, not caring. As his destination neared, the taste of bile filled his mouth. Evening dusk dropped its blanket of gray. Shadows elongated into reaching arms, and the dark edges of buildings shielded their menace. He jumped when a low branch brushed his face. The empty lot was still four houses away when the nightmare started. The roar of the fire blanketed the sound of sirens. He ran closer and boiling waves of heat and smoke rolled over him, burning his lungs, stealing his air. With his heart racing, he searched his yard, then the yards of neighboring houses. Where was she? No! She couldn’t be inside! Blackness enveloped his mind. As always, he found himself standing in the empty weed-infested lot. As the evening air chilled his skin, he shoved fists into his eyes, hoping to block what came next. The spasms of reality hit, folding him over against the pain. He tightened his jaw, determined not to give in to the hopelessness that bent him like iron in the fire. The moment passed and the present returned. It always did. He had watched the city crew a month later, after all the legal issues of her death had been properly handled, as they shoveled the charred remains of his home into trucks and hauled his memories to the dump. Now he clung to his anger because it was all he had. Anger at a world that had given him nothing. The last vestige of gray transitioned into the blackness of night. Moonlight cast a ghostly sheen over the vacant lot. Leaves shivered above him. Light spilled from windows of the adjacent houses. Sounds: voices, television, the clank of dishes. The essence of normal life seeped from the dwellings and taunted him like the beckoning finger of a vixen woman. Even the weeds came alive as they shifted in the breeze, the mocking silver ghosts of hopes stolen. So many nightmares. But the end neared. Vengeance would soon be accomplished and then, at last, his life could be reborn. An eye for an eye. A life for a life. Roger Jenkins headed back to his empty house, confident in the knowledge that Lillian Hunter would soon be on her way. Her death would be his balm. Question 1: Lillian's guilt over neglecting her husband and child led her to believe she was unworthy of a second chance. Is this sound reasoning? Have you ever felt unworthy? Answer 1: God always gives second chances to those who are truly repentant. He doesn't want anyone to live a joyless life. Satan can use our feeling of failure to his advantage. Question 2: Trina, Ted and Bill were given spiritual gifts. How did they use these gifts for His glory? Answer 2: Trina was gifted with hospitality, Ted with intercessory prayer, and Bill with insight. They listened when God spoke, even if they didn't understand the need. We often ignore God's voice, thinking it is our imagination or not important. We need to learn to discren His voice from the noise of life. Question 3: What motivated Roger's revenge? Has anyone or anything ever fed the discord between you and another? Answer 3: Roger suffered from lack of self-esteem and was naturally a follower. In childhood he lacked a moral role model. His mother-in-law used guilt to control him. Past choices allowed darkness of spirit to control his moods, and perhaps his mind. Satan uses every opportunity possible to sway us from what is right. Question 4: Bill hesitated to declare his love for Sandra because of the deep commitment he felt for his dead wife. He questioned what would happen in Heaven if he showed up with two wives. Do you agree with Ted's answer that God had it under control? Answer 4: God has every part of our lives in His control if we allow Him to. Biblically there are numerous examples of remarriage after the death of a spouse. Guilt should not keep us from doing what is sanctioned by God. Question 5: Paul probably could have prevented some of Lillian's problems, but he chose to step aside and allow Roger to date her. Do you agree with Paul's decision? How is this like or dislike God's behavior towards us? Answer 5: Paul made the wrong decision for the right reason. He chose not to interfere in a relationship he believed Lillian prefered rather than questioning her choice. This allowed Lillian free-will, but Paul remained attentive enough to intervene when disaster happened. God also gives us freedom of choice, even if we choose poorly. He, too, is there to pick us up when we fall. Question 6: Fire is a recurring theme in the book. What are the different ways fire is used? Can you relate this to anything in your life? Answer 6: Fire was shown as providing warmth and hominess when Ted lit the logs in the fireplace. Lillian found fire exciting as a child and almost burned her friend's house down. Later fire became the enemy, the destroyer of all she valued, both by claiming the lives of her husband and child, but also in Darlington by attempting to rob her of the new life she had started. Fire is neutral in itself. Just as money, time, or talents are harmless unless we use them in the wrong way. Question 7: Lillian arrived in Darlington as the product of a pampered childhood and a prematurely successful career. What events changed Lillian over the course of the book? Answer 7: Many things influenced Lillian into becoming the more humble and Christ-centered woman she became. Some of them were the friends God provided in Trina and Ted, the opportunity to see life from a different vantage-point with the homeless man and by working in the homeless shelter. Other events would be the beauty of Williamson Park, satisfaction with her job, and the warmth of the envirnment at the bed and breakfast. There are many more. Our lives are often most impacted by a series of small events rather than one large one. Question 8: At the end of the book Roger regretted his decision to kill Lillian and confessed his love for her. What caused this change? Answer 8: Roger was exposed to loving relationships based on God. He was influenced by Ted and Trina, and then by Lillian who had a deep faith even though she wavered and did not always behave in a godly way. Their actions, more than any words, drove his change. Question 9: Roger experienced nightmares after killing the first time. Later the nightmares faded. Why was this and can you relate it to anything in your life? Answer 9 We know right from wrong, and when we go against what we know is right, guilt follows. However, over time our minds become immune, or numb to sin. We no longer see it as sin, but just a part of life. Anything we do repeatedly can cause us to become desensitized. Watching too many violent movies, reading trashy books, surrounding ourselves with less than wholesome people all will change our perspective of right and wrong. Question 10: Even though she prayed, Lillian was surprised when her parents shared that they were attending church. How did God use Lillian to bring her parents into the fold? Answer 10: Lillian lived according to God's law, such as praying before meals. Her parents also witnessed the change in Lillian's values. God used the relationship she had with her minister in Cleveland as a catalist for a visit. None of her parents' friends had called over the holidays, but the minister who did not know them cared enough to stop by.